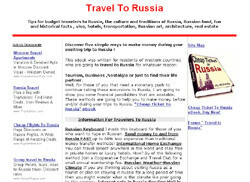 Blurb: Learn how to travel to Russia and make money instead of spending it. Tips for budget travelers to Russia, the culture and traditions of Russia, Russian food, fun and historical facts , visa, hotels, transportation, Russian art, architecture, real estate. Discover five simple ways to make money during your exciting trip to Russia. Tourism, Business ,Nostalgia or just to find their life partner.Well, for those of you that need a monetary push to continue taking these excursions to Russia, I am going to show you some financial possibilities that are available. These methods are going to help you to make money before and/or during your trips to Russia. "Cheap Ticket To Russia" ebook. This eBook was written for residents of Western countries who are going to travel to Russia for whatever reason.